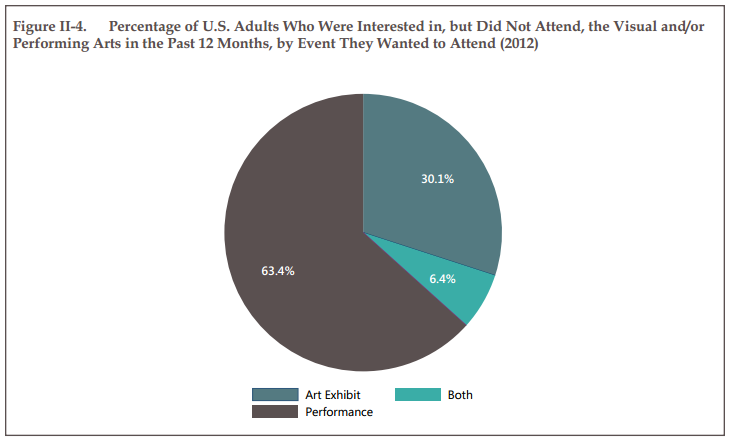 The US-based National Endowment for the Arts has recently published a study “When Going Gets Tough: Barriers and Incentives Affecting Arts Attendance” in which it focuses on this public who expresses interest in exhibitions or performing arts but nevertheless does not move (interested non-attendees). Nearly one American in seven (13.3%) was interested in going to one of the events mentioned above but did not. Knowing more about its public’s interests in particularly vital for arts organizations and institutions. In fact, attendance and culture consumption (based in the study on benchmarks such as ballet, opera, musicals, theater, classical music, jazz and exhibitions) have been decreasing steadily in the last twenty years. Thus in 2012, only 33.4% of adults have attended one of the performances and exhibitions in the past year, against 41% in 1992! 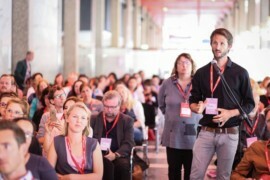 Beyond the familiar sociocultural divisions – and in fact much more subjective than you might think, as underlined by the study, the most important common motivation the public mentions when they say why they go to a show or exhibition is undoubtedly: hanging out with friends and / or family. And this concerns more than half of them. 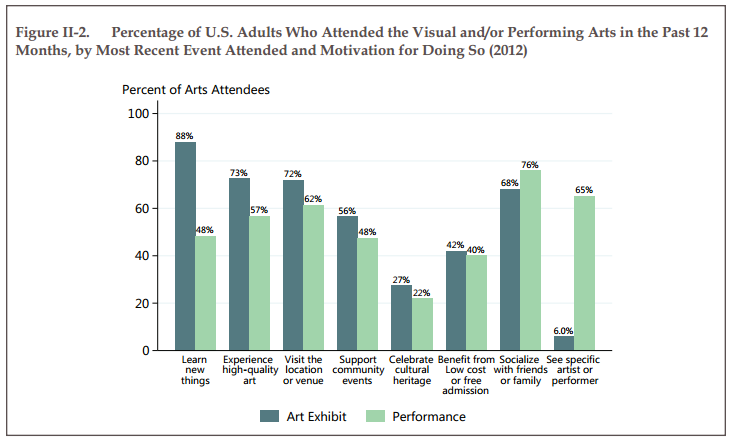 This motivation is also particularly strong for the public to performing arts (76% of respondents) vs. exhibit visitors, who prefer learning new things (88%) to socialization (68%). 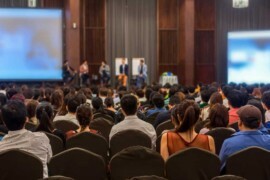 Attendance motivation varies quite strongly when concerning performing arts or exhibitions. In fact, museum or gallery visitors are more interested in the prospect of learning something, discovering high quality art – the term is somewhat surprising and very subjective – and supporting their community and geting to a particular location (I went to MoMA, I am proud and I talk about it). Performing arts attendees are, on their end, clearly motivated by the thought of going to see somebody or something in particular, but also by the possibility of socialization offered by this kind of event (they rarely go there alone, unlike museum lovers who are not accompanied for 37% of them). These motivations are therefore particularly useful when it comes to address the already coming public in a more relevant way. This study is also a great tool to develop strategies to retain one’s audience through sub-segmentation. But beside that, there remains a significant proportion (13.3%) which is interested in the current cultural offer but for a reason or another, does not make not up to the visit. In my opinion, the most important fact in that study is that a big part of arts organizations non-public is somewhat interested in the culture offer and represents about one American in 7. The main barrier advanced by respondents is the lack of time (30% of them). Lack of time is especially important for parents with children under six (60%), as it seems to be more complex to find soomeone to baby-sit. By cons, for others, the excuse is quite surprising when you consider that in fact Americans have nowadays more free time. Simply, having the time or not for certain activities is just part of a choice, already full, already made. Indeed, for 5 hours of daily leisure (95% of Americans 15+), the first choice will be TV watching, then exercising and finally socializing activities (bars, dinners , etc.). The latter is particularly interesting when considering arts attendees first motivation: socialization. Perhaps is there something to work on? the fact of having no one with whom to get there (22% of them). It is also important to note that people who have cited cost as a barrier to cultural consumption are 78% to mention as a major obstacle. Last but not least key point to note is one’s perception of one’s social and economic class. This follows perfectly Bourdieu’s studies on cultural capital. Indeed, it is not only the degree or income level or belonging to a certain economic category that hinders cultural consumption, but the perception people have of theirs. Thus many Americans “downgrade” (2/3 of the middle class members say they belong to the working class) or “upgrade” themselves (1/3 of working class members say they belong to the middle class). The failure to perceive themselves in the right socio-professional category make individuals to adopt behaviours of this category instead of their objective theirs. 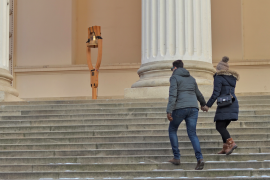 This study offers a great background before launching a public and cultural development strategy: what kind of public are we looking loyalty from and how? Although this study focuses on US (and therefore the entire chapter beased on racial and political behaviors needs to be taken lightly), the main motivations of people going (or not) in cultural sites are particularly interesting and might help institutions to bring some diversity in their cultural and public policies instead of focusing – too much maybe? – on specific fares and triggers.